Hey is anyone still interested in having a cricut community here? If so comment! Let's get back to having fun! brand new trim the tree. and a gently used in new condition joys of the season. Hi, I just bought a Cricut Expression off of eBay, brand new never been used. It came today but when I set it up and tried to use it, the LCD display doesn't come on and none of the buttons are responsive. I'm just devastated because I was so looking forward to playing with it today! Has anyone else ever had this issue? Is it just my bad luck? I emailed the eBay seller and if nothing else I hope I can exchange this one for a new one, but I would much rather make this one work! Thanks in advance! If all of the cartridges were this good, I'd have bought them all this week. I love all the variety of cards I can make and since I use it more for cards than scrapbooking, this is the one I'd recommend every one have. It should be labeled a bunch of useless tags, a few bags and boxes, and the more is just a lie. Also there is no way that I can tell to judge the size of the boxes. I ended up making a supposedly 7 inch box to get a 5 1/2 inch box for a cd. Cricut cartridges are $39.99 at Michael's this week. The design studio is $49.99. I just got the Cricut Expression from my mother as a gift a week ago with a number of cartridges. I bought the design studio yesterday and installed it on the computer last night, so now I'm tired after playing on it too late. 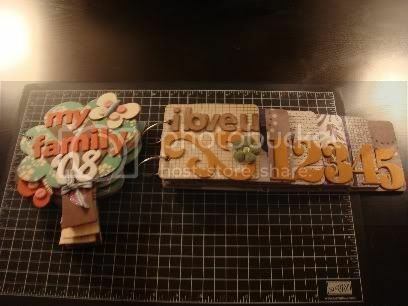 I have never scrapbooked before, but I have two babies so the opportunities are ripe for me. So far I have only used the machine to make cards and a small gift bag, but I'm pretty excited about the possibilities. I've been playing with google looking for example projects and also for information on fabric cutting (I'm a quilter and sew quite a bit). Just a note: The cricut jukebox is on sale at Michaels for $59.99 until Saturday!! ALL CRICUT CARTRIDGES ARE JUST $40 AT MICHAELS THROUGH AUGUST 2ND!! So, I'm very interested in getting a Cricut, but I'm wondering how "worth it" it will be. I'm in college, so even getting a discounted one on E-bay for $100 is a big buy for me, and I want to make sure it's not going to be a waste. Do you really love your Cricut as much as the people on the commercial claim? Has it really been worth it to you monetarily (i.e., do you save money by doing your own stuff instead of buying them at a store?)? I guess what I'm probably worried about the most is the whole cartridge deal--how many cartridges do you have? How many would you say you "need" to make the Cricut worthwhile? I can't seem to find a place that shows exactly what shapes come with a cartridge. Does each cartridge come with multiple fonts or only one? A few shapes or many? Also, as I'm looking at buying options, where would you say are the best deals? It looks like you can cut about $150 off by doing E-bay, but I wasn't sure if there were packages (machine + several cartridges) available somewhere. Finally, are there any similar machines that you've used? Which do you prefer? Have any of you heard of this product yet? It doesn't look appealing to me just yet. Keep everything you need at your fingertips with Cricut Jukebox. Never Swap cartridges again! 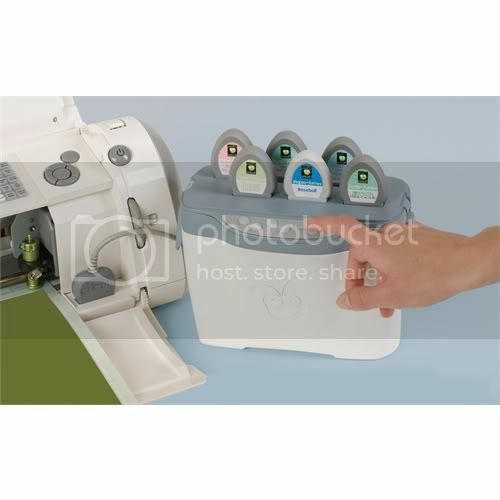 Insert up to 6 cartridges into the Jukebox base, connect it to any Cricut machine and select your cartridge with just the push of a button! Link up to 3 Jukebox core units at a time letting you use 18 cartridges with ease. Stack and connect Jukebox tops to access your entrie cartridge collection! Store up to 6 handbooks and overlays in each Jukebox base.